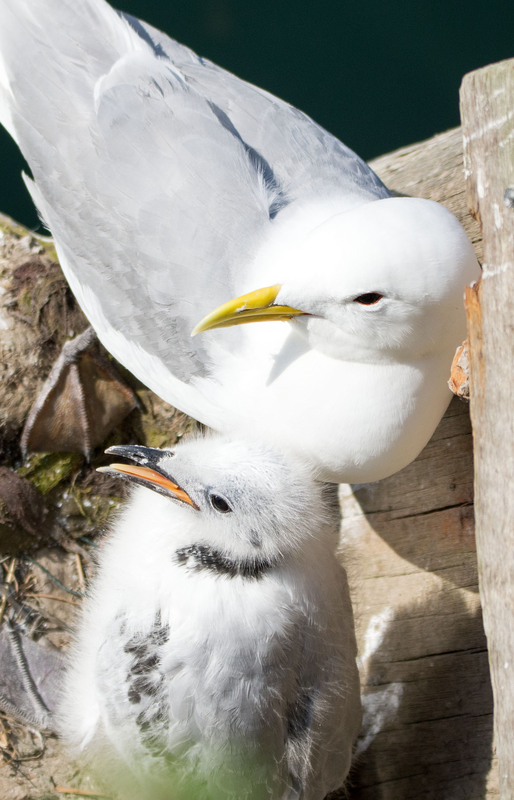 Kittiwakes are such good parents! They each spend roughly the same amount of time on the nest looking after the chick(s), whilst the other goes in search of food. During the day, each bird is away from the nest for about 2 hours and 48 minutes (on average) apparently, searching for food to bring back to feed the hungry mouth, or mouths. There may be one or two chicks, occasionally three. 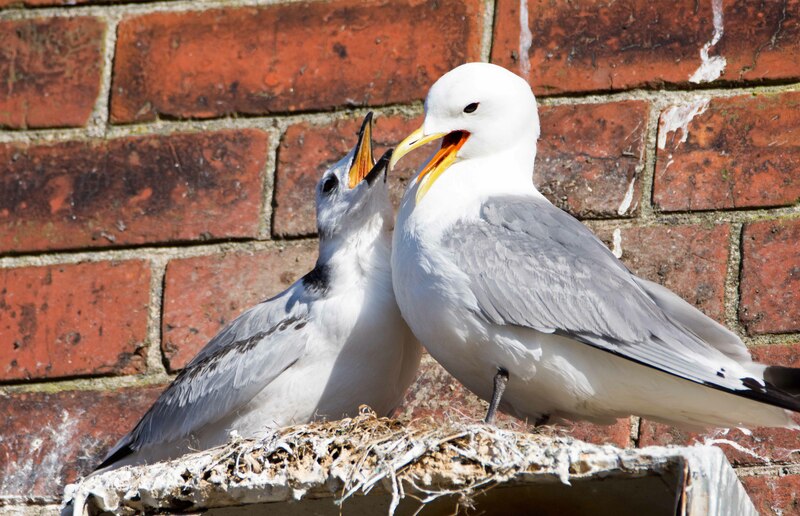 They have a delightful greeting ceremony when one birds returns to the nest and reinforces its bond with the remaining partner. A short while after the greeting, without any ado, they change round and the other bird flies off. 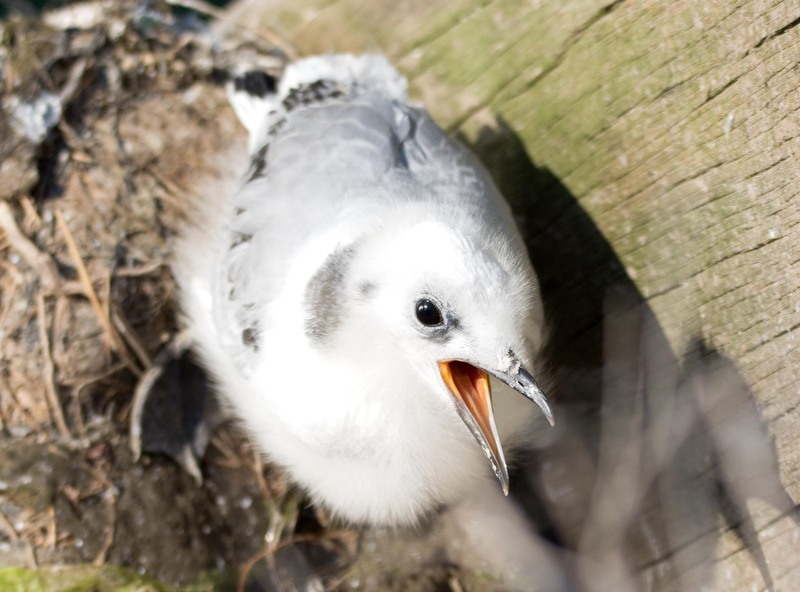 The chicks get four or five feeds per day on average (data obtained from the Farne Islands) which provides them with up to 125g of fish per day, although this drops off as they approach fledgling. Despite the hard work of the parents, the chicks seem to beg continuously, even when the parent is dozing! There is a week between the photographs above and below, of birds nesting in an old, disused electrical junction box by Scarborough harbour. The parents are also very dutiful; one parent is almost always present on the nest until the chick is about 33 days old and a reasonable size. 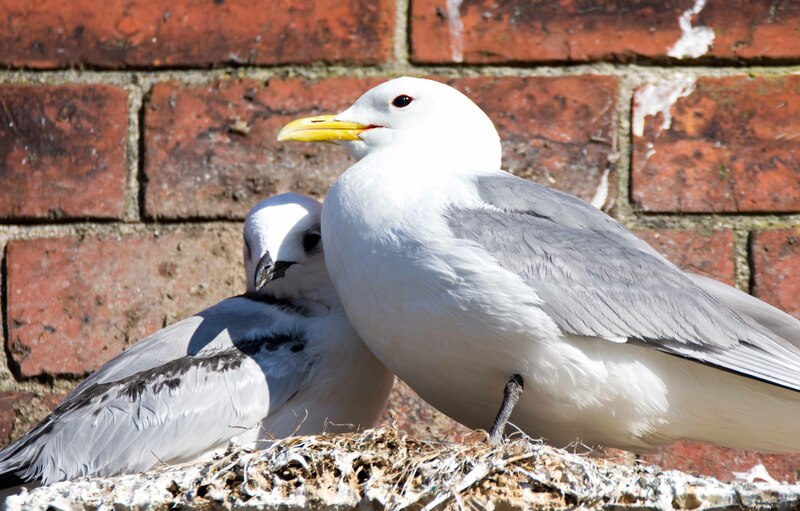 In situations like in Scarborough, where there are greedy Herring gulls living cheek by jowl with kittiwakes, the parent needs to protect the growing chick from being predated. 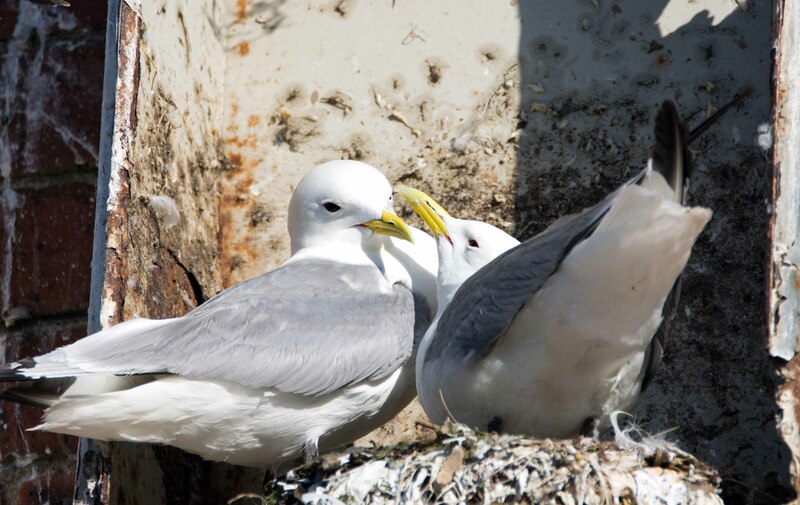 In some sites in Scarborough, including by the lighthouse and on the window sills of the Grand hotel for example, kittiwakes have nests which are very close to where people walk by. They have presumably adapted to the stares and gazes of humans, but the parent birds are occasionally flushed off the nest by a disturbance, but they soon return. 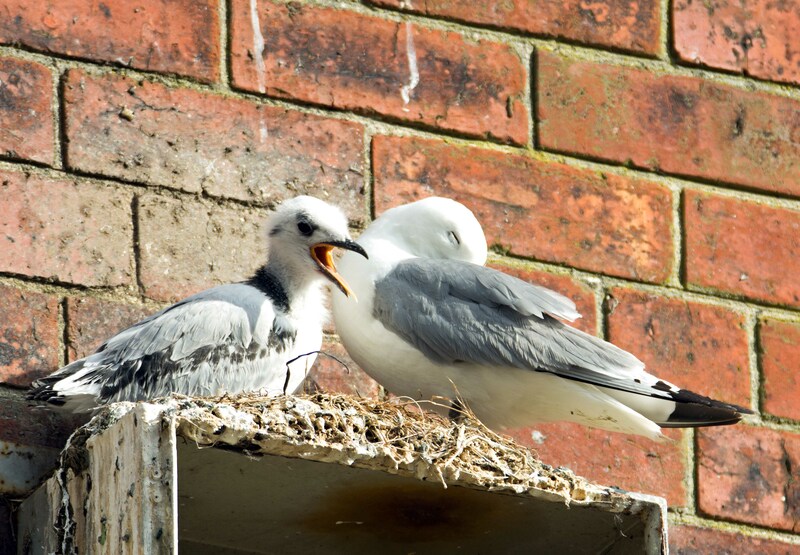 Unlike Herring gulls, kittiwake chicks seem better adapted to urban life and don’t seem to fall off their ledges very often! We are I think, extremely fortunate to have this beautiful bird living with us in Scarborough. I for one, love their iconic call, and relish witnessing their live cycle every year. 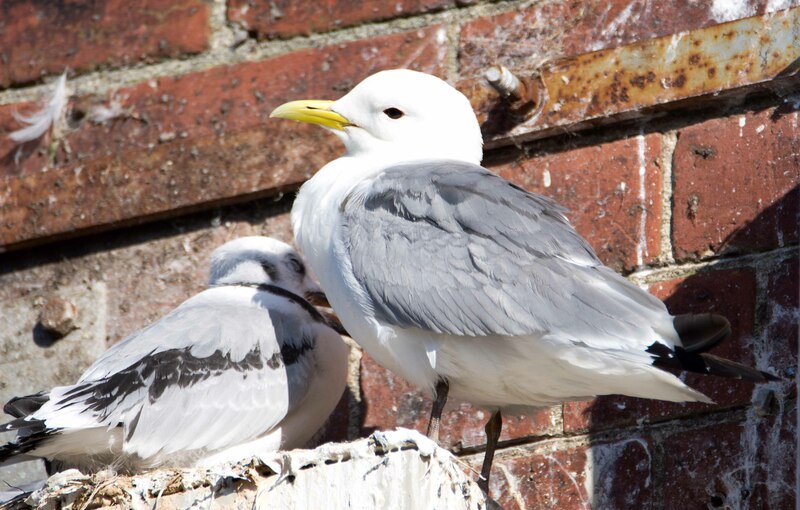 The fact that they can survive the rigours of the North Atlantic during the winter (see link 1 to previous blog), yet sit on a ledge above a shop every summer, increases my admiration for this remarkable bird. Facts and figures taken from: Coulson, John. 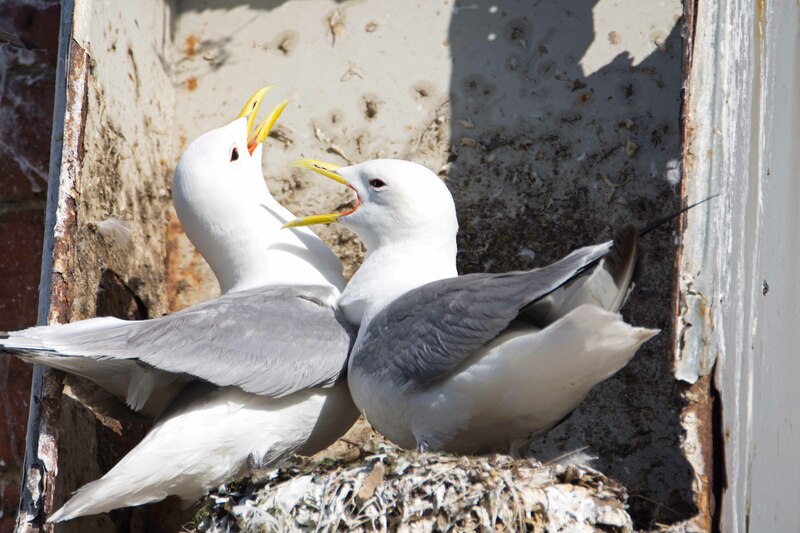 The kittiwake. A&C Black, 2011. Previous Previous post: Bees knees and tongues! Next Next post: Orchids come and go! Ray Cannon's nature notes Such good parents!